The Washington Capitals set the tone of the Eastern Conference Final Friday night with a dominating 4-2 performance in Tampa Bay. 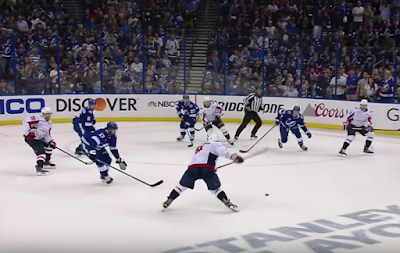 A clean face off win by T.J. Oshie to Evgeny Kuznetsov makes the whole play possible. Then a quick dish from Kuznetsov to Ovi's wheelhouse was all that was needed to beat Andrei Vasilevskiy's glove and the clock. The Caps would go to the locker room up by two going into the second period. This two-goal margin would turn out to be the cushion they needed to take game one. Do you think the Lightning will respond in game two on Sunday? Lets us know in the comments!